How to praise art work? This is a tricky one - when I started my teacher training I've learned you should never praise a child's art work, instead you should ask if the child likes their work and what they wanted to show. And basically only say "ah, oh, uh"... The reason behind that was to make sure the child does art for themselves, and not to please the teacher. Fair enough, but, trust me, that felt so wrong! Because sometimes I felt like saying "WOW! What a great work!" Simply because quite often I am blown away by the work students produce. So I was listening to teachers I admire and heard: Just tell them you love what they did. No matter how it looks to encourage them to keep on going. Well... Also not really an approach I liked. And then, of course, there are the hardliners, who actually say to a student when something is "WRRRONG" in their art work... My favourite sentence: "Have you ever seen a cat with such big eyes?" There is no right or wrong in art at the first place. Nobody in the whole world draws or paints in a way that everything is RIGHT! Art is all about our feelings and how we see the world around us. And especially children and teenagers have a completely different perception of the world. But what do I do when a student shows me their work? 1. Look in their face! Are they proud? Are they scared about your judgement? Do you feel they like it? They can't be bothered? - If they are proud, praise the work, tell them what you like about the work. - If they look scared, ask them why they are scared? Ask them if they need help with something? - If they can't be bothered, ask why, and maybe have a big laugh with the student about it, and usually, next time they care. 2. Look at the art work! Tell them what you like! Every piece has something great in it. Point this out!!! 3. Let them talk about it, let them find a title, let them be proud. Please never say when something is in your opinion, wrong. 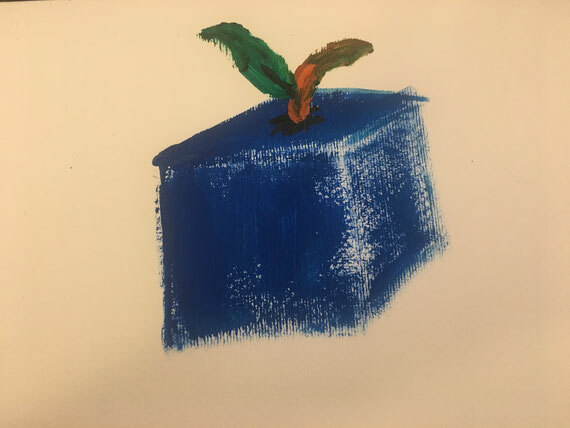 Even if an apple is blue and square! Everybody is an Artist! Really!